There is no easy way to tell if you have celiac disease. There are hundreds of symptoms that occur due to celiac disease, but some of the most common include diarrhea, weight loss, fatigue, bone or joint pain, and migraine headaches. A person with celiac disease is unable to digest gluten, as it causes damage to the tiny finger-like tissues in the small intestine called villi. The disease affects close to 1 in 100 people worldwide, with many going undiagnosed. There are around 300 symptoms a person with celiac disease can display, making diagnosis difficult. It is important to note that some people with celiac disease may not display any of the aforementioned symptoms but can still be affected by the long term effects of the untreated disease. Testing for celiac disease is most effective while you are still consuming gluten. A physical exam, medical history findings, and blood tests help in diagnosing celiac, but an endoscopy and small intestine biopsy are the best sources of confirmation. A lifelong gluten-free diet is the only effective treatment for celiac disease. In some circumstances, medication may be prescribed to treat the symptoms and side effects. A healthcare professional will be most helpful in identifying and treating any nutritional deficiencies and other problematic symptoms that can come with a gluten-free diet. If you think that your symptoms could be signs of celiac disease, stop in for a visit with a medical professional at FastMed Urgent Care. We do not require appointments, and we offer extended hours during the week and have availability over the weekend. Our professionals provide care that is compassionate, high-quality, affordable, and fast. We aim to get you in and back out on your way in under an hour! Contact us today and find a Fastmed Urgent Care location near you! 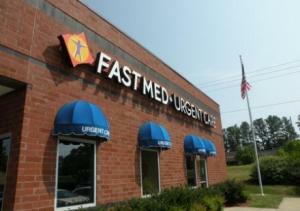 Like us on Facebook and follow us on Twitter to learn more about FastMed Urgent Care in your community.